Ping-Pong is a variation on Fizz-Buzz. We did this project for our week 3 independent code challenge in the Epicodus Intro to Programming course. The assignment is similar to a coding challenge known as “fizz-buzz” that apparently shows up on a lot of job interview coding challenges. It also used to be the entrance exam for Epicodus, before they added this “Introduction to Programming” course. We had 8 hours to work on the challenge, and were not allowed to leave early. By lunch, everyone I talked to was done with the coding and had moved on to working on the design, or gone back to some other project from earlier in the week. It was nice to see classmates that were worried about passing on Thursday talk about how easy the challenge was on Friday afternoon. I think most of us tried to do some kind of “ping pong” look and feel to the project. 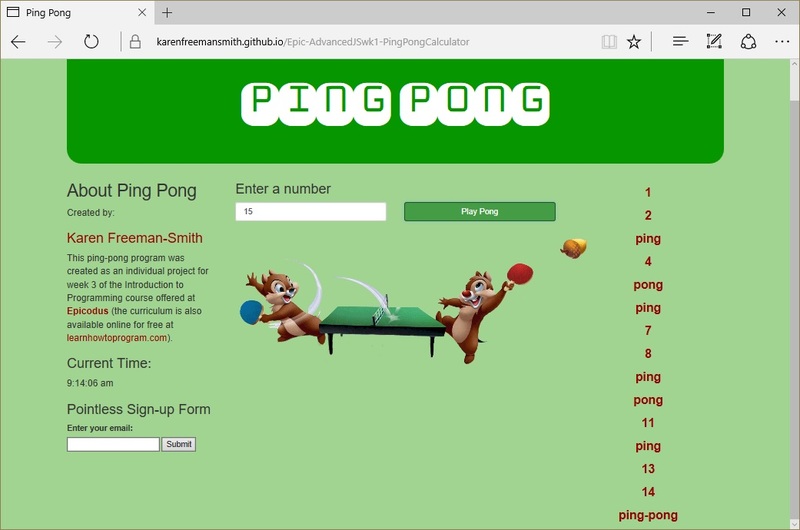 The night before, I spent a few hours finding the image of these chipmunks and editing out the acorn so that I could (hopefully) animate it to bounce back and forth across the screen while playing some ping-pong sounds. By the end of the day I got the acorn to move and the sounds to play, but the timing was still messed up when I turned the assignment. January Update: Once school was out I had time to take another look at the sound and animation and try to figure out how to make everything work the way I really wanted it to as far as the timing is concerned. I got a little help from Stack Overflow to get it working.